Laurel Mountain Group is located on a 96 Acre Farm in South Western PA.
Laurel Mountain Lemonade and Iced Tea is very popular at many local festivals and fairs. Our drinks are each custom made using a hydraulic press to squeeze the juice from the fresh lemons or limes. We use fresh strawberries, raspberries, blackberries, blueberries, and peaches in our made to order, ice cold, lemonades and iced teas. Laurel Mountain Kettle Corn makes delicious kettle corn in a variety of flavors such as caramel, apple cinnamon, rainbow fruit, caramel apple, and of course our very popular “patriotic pop” (red cherry, blue raspberry, original). For Kettle Corn fundraiser information click HERE. 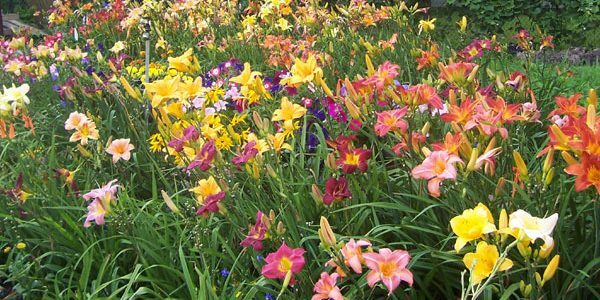 Our Nursery was started back in 1972, We now specialize in growing hybrid daylily plants and Christmas trees. Our Famous decorated Christmas wreaths are available for pre-order in early November and earlier as a group fundraiser. Form More Info, Click HERE. Gems By Mail has the largest selecting of rough rocks for tumbling in the USA. We specialize in rough rocks, tumbled polished stones, and faceted gems. We carry all the silicon carbide grits and polished need for your rock tumbler. Check it out at www.gemsbymail.com and sign up for our weekly newsletter featuring many great deals and special pricing.